In 1974, when I decided to change my career from banking to nursing, I would never imagine I would meet the person who would become my role model, and later my sister-in-law. I met Margaret when I was hired as a nursing assistant at Belmont Hospital. I was assigned to the fourth floor, Med-Surg unit, on the 3:00-11:00 shift, and Margaret Harper was my charge nurse. She was fun to work with and she made sure that we gave the best care to our patients. She didn’t tolerate sloppiness; your duties were to be done properly with no shortcuts. As I progressed through nursing school, I used to share my newfound knowledge with Margaret, excited to explain to her something in detail that she already knew. She was always happy to hear me out and give me encouragement; and I really needed her affirmations, since I was returning to school after working four years and had my doubts about being able to succeed. So, for the next four years, as I studied at Truman City College to obtain my nursing degree, I was already learning to be a nurse as I worked side by side with Margaret. I observed and absorbed everything I could as I watched her care for our patients: gently rolling of a comatose patient when changing a bed sheet; combing their hair and speaking softly to them with respect; softening hands and feet with lotion. They were not awake and they couldn’t say “thank you” but it didn’t matter to Margaret. Calming a confused and combative patient without showing frustration or anger. Loving them by understanding they were not in their right mind. Not taking personally insults or complaints made by someone just diagnosed with cancer. Hugging a patient going home after spending several days in the hospital. Finally, going home. Margaret taught me to look beyond a person’s behavior and consider “what are they going through?” Try to understand. Go beyond the textbook. I’ll never forget the sinking feeling and confusion I felt when Margaret walked on the unit one day, tearful, with Audrey St. Marie at her side, and complaining of a severe headache. After her diagnosis of brain tumor, and decision to have surgery at Mayo Clinic, I wanted to show my love and care for her by visiting her there. I had never met Dan, but she asked him to call me and suggest I drive up with him and another friend. I agreed, and that was the beginning of what would become our marriage a year later. Margaret gave me two precious gifts: the privilege of learning how to pass on the love of Christ while ministering to the sick and the dying, and secondly, the opportunity to meet her little brother, Dan. I am blessed. Thanks be to God. Mental Multivitamin calls it synthesis / serendipity / synchronicity. It’s that glorious connection between what you just read/saw/heard and—in an unexpected way—what you are currently reading/seeing/hearing. The practice of reading (deep and wide) is in effect laying down a swath of Velcro loops. And along comes something that enhances, expands, expatiates on what you already know: those are the Velcro hooks. That aha! moment brings me great joy. My husband wishes he had written down every hunting experience he’s had since he was seven…for the pleasure of reliving them. I wish I had noted each experience of synthesis / serendipity / synchronicity in my reading life; for there have been many and, alas, my mind grows dim. For a year I have been plowing through Jacques Barzun’s From Dawn to Decadence: 500 Years of Western Cultural Life 1500 to the Present . It is demanding and daunting. Twenty years ago I wouldn’t have had the fortitude and background knowledge to pull through. But it is rewarding in the same way that losing thirty pounds is rewarding. Barzun writes several pages about Beaumarchais, the author of The Marriage of Figaro, artisan, wit, pamphleteer, and secret agent. Have you heard of him? Me, neither. Barzun calls him “the most effective helper of the [American] colonists in their war.” Do you find that an arresting description? Mozart wrote an opera based on Beaumarchais’ story which challenged the French aristocracy, making Figaro, a valet (or barber), more noble than his master. When I’ve been home alone this week, I have listened to Joseph J. Ellis’ history, First Family: Abigail and John Adams . After a five year separation, Abigail and her daughter Nabby joined John and John Quincy in Paris. The Adams family “attended an early performance of The Marriage of Figaro.” Hello! 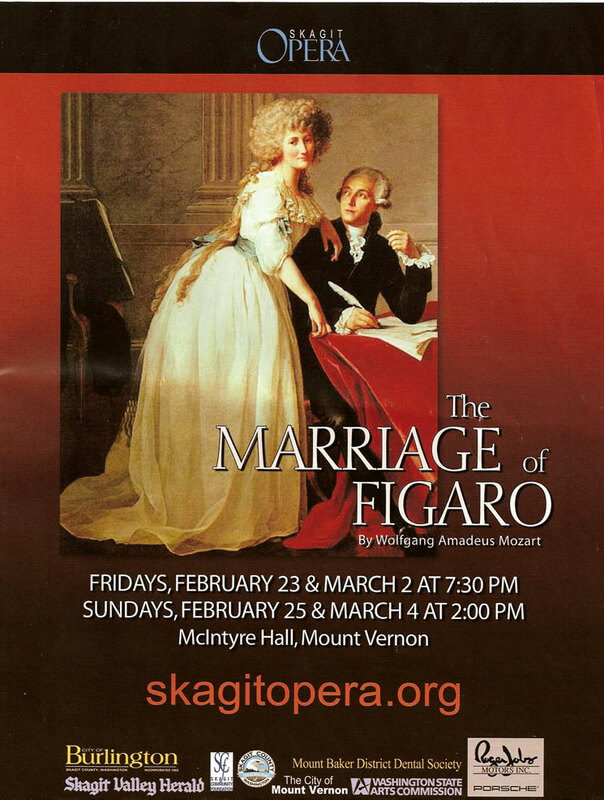 I just read about significance of Figaro!! I reveled in the realization that for a time John and Abigail Adams and Mozart were both living and breathing in relative proximity. Three weeks ago I visited my friend Lisa in North Carolina. She had been culling books from her shelves and gave me a quaint 1913 book called Opera Synopses. In it I found more information on The Marriage of Figaro ; I learned the story is a direct continuation of Rossini’s opera The Barber of Seville (created by Beaumarchais). I had previously read that sentence, but because I didn’t have any Velcro loops of interest or connection, that fact just bounced off my brain. The synthesis, the recognition, made those words adhere. So what? Although I am familiar with the overture and several arias, I have never seen the opera. I started to watch it on YouTube this morning, while I wrapped Christmas presents, but quickly realized that three hours of opera wasn’t on the agenda today. And if I’m going to be thorough (cough, cough) I should start by watching The Barber of Seville first. I’m slowing my pace, enjoying the feast. I need it. We need it. unwilling to change: a miserable route. Humility is the path to growth. This morning, reading a reference to El Greco’s stormy sky over Toledo, I was taken back ten years. Now it was Collin’s turn to demonstrate incredulous. We had been reading about the Auto-da-Fé. If he knew anything, he knew that Toledo was a city in Spain. He’d never heard of Toledo, Ohio. Steady, I thought, steady. I smiled. You are both correct! Toledo is a city in Spain and a city in Ohio. It makes me curious? Did you know both* locations of Toledo? 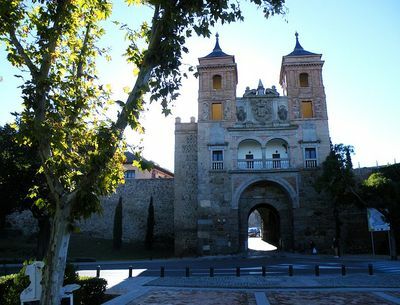 *Per Wikipedia, Toledo is a also district in Belize, a municipality in Brazil, a town in Colombia, and a city in the Philippines, in Uruguay, in Illinois, Iowa, Oregon and Washington. Here is the loot I brought home from my brother’s house. He must love me: he let me borrow anything from his vast Teaching Company library. David and I share a thirst for learning. Several years back, I bought a suitcase in Pennsylvania and filled it with bulky Teaching Company courses—mostly Medieval studies and music history—on cassette. Did you know that you can replace the cassettes with CDs for $10? Luther, Literature and Lee. How is that for good stuff? I had two instances of yearning this week. My nephew’s Facebook status was “Off to Top of the Rock and MOMA” His days as a resident of New York City are almost complete; he’s playing the tourist before he goes off to grad school. 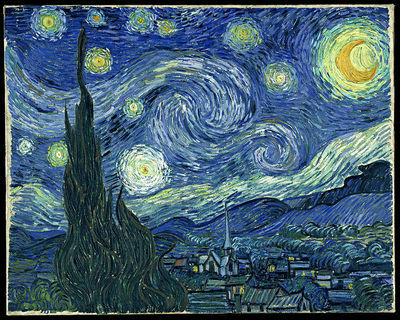 MOMA is the Museum of Modern Art, home of van Gogh’s famous piece The Starry Night. Oh. (sigh) Wouldn’t it be grand to stand in front of that painting and absorb it? To see the brush strokes and shades of blue? I lunched with a friend back from a visit to Scandinavia and northern Europe. 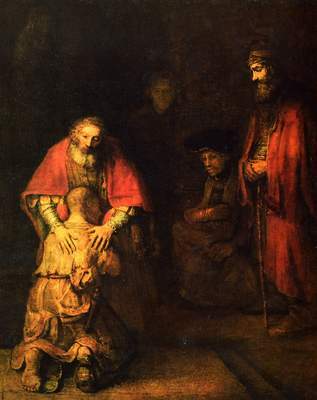 She spoke of the glory of seeing several Rembrandts at the Hermitage. The State Hermitage Museum in Saint Petersburg is one of the oldest and largest museums in the world. Thank you very much, Catherine the Great! [Saint Petersburg is quickly inching its way up into my top cities I want to visit. Florence is first. Then it’s a scramble between Budapest, Paris, London, NYC, Istanbul, Jerusalem, Athens, Dubrovnik, Ephesus, Cape Town…and, of course,…Saint Petersburg.] I sat there, sipping iced tea, and imagining a day at the Hermitage, the leisure to linger in front of Return of the Prodigal Son examining details like the bottom of the prodigal son’s feet. I yearned. Then, mirabile!, thanks to Meghan at Pink Peppers I learned about Google’s Art Project. Start by watching the Visitor’s Guide. Oh, people! Do you see the possibilities? The challenge is that there is so much to see. 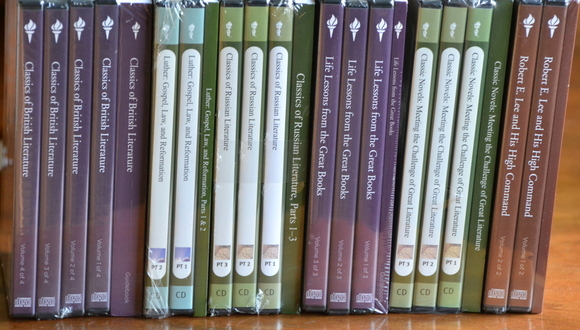 It’s like getting a set of Harvard Classics delivered to your door; it’s easier to look at them than to begin reading. I’ve been wanting to revive Fine Art Friday and this seems like the perfect vehicle. Next week I will start a visit to The Hermitage. I have a focus.